Say Nothin’ To No One – Project Arts Centre – Review by Frank L.
Kian Harris (Thomas Kane Byrne) is a career shoplifter. He prefers to operate at the upper end of the market in the milieu of Brown Thomas. Fashion is his obsession so Prada and its ilk are his likely prey. His partner and a consumer of his “work” is Charleigh Brennan (Ericka Roe) who is a “career session moth”. They both have a yearning to escape and London beckons from inner city Dublin. Needless to say there are many false starts, mishaps and scrapes in this very fast-moving, comic play. For this production, the Project Art Centre’s Cube stage is transformed to a narrow central aisle from which ascends on each side three rows of seating. The audience looks across the aisle at each other which is therefore not all that dissimilar to the layout of an upmarket fashion show. Clearly, Thomas Kane Byrne is very much at home in this environment. He is a substantial figure with an impresive hairdo which is one of his trademarks. As Kian he makes his appearance at one end of the aisle. He has a commanding presence with his besequined clad top making him even more imposing. He rapidly fills in the audience of the challenges of being an upmarket shoplifter and the various challenges he has overcome in his life to achieve his current level of professional success. From the other end of the aisle there then appears Roe with her striking blonde hair, dressed in a sparkling gold rig-out which would make her difficult to miss in a very dark street. They tell their respecitve stories and where they intertwine with a rapid verve. Thomas Kane Byrne is a talented writer with a happy facility to create thought-provoking images. He has his finger on the pulse of a changing Dublin. A weakness that both he and Roe suffer from is that in the rapid fire of their delivery, at times they do not project their voices as clearly as is necessary to be comprehensible. There is a tendency for the words to become garbled in the speed of it all. That said as a pair of actors they have a clear affinity and it is obvious they derive great pleasure playing off each other. They are well matched. This is sixty minutes of fun but like all good comedy there are nuggets of observation that are worth contemplating after the show is over. 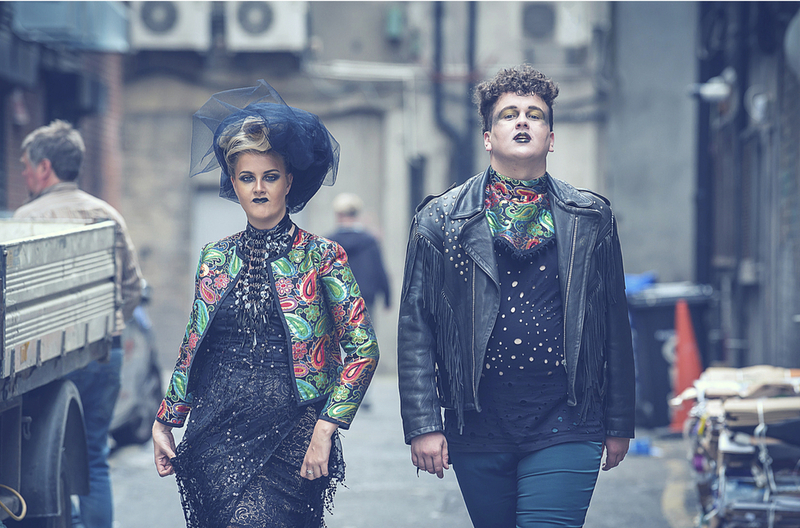 Roe and Byrne are founders of the Breadline Collective which is the base from which they collaborate. They are creating their own distinctive voice that is entertaining and most importantly connects with and engages a young audience. For those of an older generation maybe they are becoming the new Jimmy O’Dea and Maureen Potter. This play shows that they have a rich ore of comedy to mine and this production provides a fine catwalk for them to flaunt their talents.